This is the second book in the Marie Antoinette series. I have previously reviewed the first book, Becoming Marie Antoinette. Marie Antoinette is now Queen of France, following the death of her husband’s grandfather. However, she is not yet a mother, nor has she even been given the opportunity to become one. As a women who both wants to become a mother and a queen whose duty is to become one, this childlessness leaves a hole in the queen’s heart. For Marie Antoinette, that hole is partially filled with parties, Le Petit Trianon, card games, and extravagant coiffures and gowns. Her extravagances lead her to be increasingly despised, particularly as members of the extended royal family create a smear campaign against her as a way to weaken the king’s authority and enhance their own. 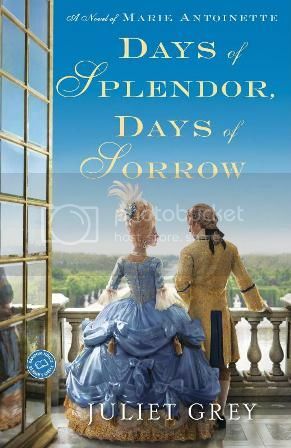 Days of Splendor, Days of Sorrow spans the time between when Louis and Marie Antoinette become king and queen and the meeting of the National Assembly and the storming of the Bastille. Over the course of the book Marie Antoinette becomes a mother and matures, but if anything her reputation with the French public becomes worse. As in Becoming Marie Antoinette, Juliet Grey has transported her readers into 18th century French court life and particularly Marie Antoinette’s consciousness. I really appreciate that Grey has decided to take a trilogy to tell Marie Antoinette’s story, instead of simply a single novel, because it really helps readers understand how and where her world went so terribly wrong. Not only are Marie Antoinette’s motivations – particularly for her party girl ways early in her queenship – more easily understood, but so are the reasons for the French Revolution. In fact, I think only in nonfiction have I seen the causes of the French Revolution so well laid out. 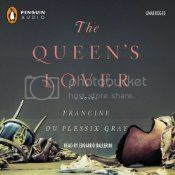 This period of Marie Antoinette’s initial queenship is perhaps not the most exciting period of her life, but Grey manages to keep Days of Splendor, Days of Sorrow interesting. I appreciate that the books in this series could be read as standalones if one has a basic knowledge of the history, but they are undoubtedly more effective when read in series order. I cannot wait for the The Last October Sky, the last book in this series, which is scheduled to be published in 2013. If these first two books are any indication, The Last October Sky will be a powerful read. Xenia has always been a strong young woman, sure of what she wants. When she marries it is as much for love as anything else, and Xenia desires little more than to have a child with her husband. However, Xenia fails to conceive for many years, and when she does conceive she loses. Always sensitive and prone to prophetic dreams, the last straw for Xenia is when her husband dies in a freak accident following a ball thrown by Empress Elizabeth at the palace. Before long, Xenia has lost all reason and disappears, only to reappear some years later as the soothsayer and healer, St. Xenia. 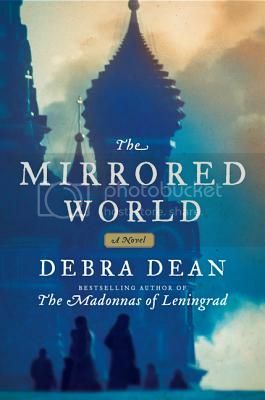 Dean’s The Madonnas of Leningrad is one of the last books I read before I started blogging and I adored it, so when I heard she had another novel coming out, I jumped to read it. In some ways, The Mirrored World is slightly less accessible than the WWII-era The Madonnas of Leningrad, as many Westerners may never have heard of Russia’s St. Xenia. The Mirrored World is a reimagining and humanizing of the saint’s life from the point of view of her cousin, and I can’t help but think it would be somewhat more meaningful and compelling if one is familiar with the saint in the first place. That being said, The Mirrored World is still a strong book. Dean’s writing is lovely, and her main character – Xenia’s cousin – is well-drawn. Xenia herself is somewhat vaguer, but as she becomes a holy fool, that is a wise decision, as attempting to get inside the mind of a disturbed and grieving woman who disappears and reemerges as a soothsayer seems a recipe for disaster. The Mirrored World is an interesting look at a historical personage about whom I knew very little. Even if you have no inherent interest in St. Xenia, Dean’s writing still makes this a book worth reading. Recommended. After both of her parents die on their crossing from Ireland to America, seven-year old Lavinia is taken on as an indentured servant by the captain of the ship on which she sailed, in order to pay for her fare. As the only white indentured servant on the plantation, Lavinia’s place is somewhat uncertain. She lives with the plantation slaves, but is educated by her master’s family and treated completely differently than is the rest of their help. Inevitably, as Lavinia grows up, her dual identity as a white and eventually free person and someone who considers herself part of a family whose other members are enslaved causes problems that may put her and those she loves in danger. I don’t know if it has to do with the books I happen to pick up or what is being published at any point in time in general, but I oftentimes find myself in a morass of historical fiction, drowning in books which are all on the same topic. As such, “The Kitchen House” was very refreshing indeed. 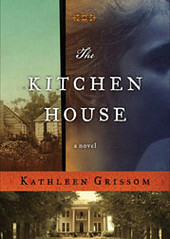 I have only read one other book with a character who is an indentured servant, and the quality of the writing and storytelling was definitely better in “The Kitchen House.” Lavinia was not the only narrator, the enslaved woman with whom she lived, Belle, also narrated some chapters, although she had a small percentage of the book as compared with Lavinia. Grissom handled the dual narrators well, however. 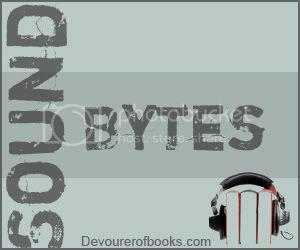 Belle was able to show the reader things that Lavinia could not know, but was given enough depth and emotion that her narration did not seem just a cheap plot device, but actually enhanced the story being told. I thought the narration was terrific. For more specifics, please see the review I wrote for AudioFile Magazine. I think this would be enjoyable either in print or in audio. Recommended.